First published in 1972, this book provides an important critical review on the theory of futures trading. B. A. Goss looks at the work and ideas of Keynes and Hicks on futures, and considers how these have also been developed by Kaldor. He discusses the evolution of the concept of hedging in the context of buying forward into the markets, and considers theories of market and individual equilibrium. 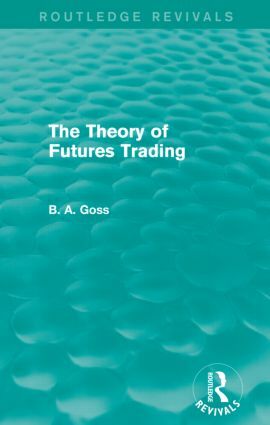 Goss draws on the work of other economists in this field, including Stein, Telser, Peston and L. L. Johnson, in order to illustrate the development of theory in futures trading. The book includes fifteen figures that illustrate diagrammatically the concepts involved, and the concluding section contains a series of problems for examination by the student.